Think water storage is the bicycle tourists only concern? Hah! What about wine? If you’re looking to keep spirits up you need the Platypus Wine Bag. Whether you are a connoisseur, an enthusiast or a casual admirer of wine, one truth remains: the delicate taste of wine change upon exposure to oxygen. That means wine is best enjoyed within a few hours of being opened. If not properly preserved, wine can go bad in as little as 2 to 8 hours. PlatyPreserve is the best way to protect the taste of an opened bottle of wine by completely eliminating the presence of oxygen. While alternative methods might have you pump air out of the bottle or inject gas into the bottle- PlatyPreserve has you transfer your un-finished wine into an air tight reservoir to truly protect the taste of your wine so it may be enjoyed several days or even weeks later. Collapsible containers offer an easy, light-weight alternative to pack and enjoy wine wherever you go. Select materials ensure superior leak protect and provide zero taste transfer to your wine. The three environmental factors that damage wine are: oxygen, temperature, and ultraviolet light. The PlatyPreserve solves the first factor by isolating your wine from oxygen. You can deal with the other two factors by storing the PlatyPreserve in a cool dark place. Ideally the storage temperature should be held constant at 50 to 52 degrees F. Higher temperatures and bright sun or fluorescent lights can damage wine no matter what the container. Seoul, South Korea- On a typical weekday morning, long before the sun has risen, we can be found by the Han River battling through the debilitating winds and freezing temperatures that can make even the most dedicated athletes call it a day. The rest of our time is spent thawing our toes and studying our maps. With less than 50 days until we embark on the Long Haul for Hunger bicycle tour, Derek and I are stepping up our training programs, no matter how cold it is outside. We look like aliens with all of our winter cycling clothing on. Really loving my Gore Windstopper jacket at the moment. Our current training program is in its 2nd phase and we’re transitioning to our final phase of preparation. From now on we will spend 5 mornings a week on our bikes, I will be putting in 30 miles a day during the week, and doing a 50 mile ride once every weekend. We want to get plenty of time in the saddle before getting to China. Attaching addition water bottle cages to our bikes without screws or bosses is something bicycle tourers do often. There is often a need to increase the bike’s water carrying ability in order to increase our biking range. Cyclists also add water bottle cages to carry camping fuel and endurance gels/powders. Since so many of us doing it, it is a bit of a surprise that there isn’t a ton of information on the methods of attaching extra water bottle cages to your touring bicycle. It’s often difficult to find hardware for these upgrades as well. We’ll take a look at some of the different options for adding water bottle cages once you’ve run out of cage bosses. At the bottom of this post I’ll include some useful links that will further help you out in your next bicycle upgrade. First we’ll look at some of the companies offering mounting cages for water bottles without bosses. These additional water bottle cages are useful for those bicyclists who have extra space on their handlebars for some water bottle cages. For me, I have limited space because of my cycling computer, topeak handlebar bag, and mirror. The only really useful option for adding water bottle cages to my handlebars is a single bar-wrap type mount which I can place on the bar. Below are some options for adding water bottles to your handlebars. This is the Minoura Bottle Cage Holder BH-95x. This is my recommendation for mounting a single bottle on your handlebar. This product is inexpensive, effective, and respected. model which allows you to mount 2 water bottles to the center of your handlebar. If you don’t have a handlebar bag up there, this would be a great bicycle upgrade. Nashbar offers a simple handlebar mount for 25.4mm handlebars only. This is the Electra Cup Holder and this is more of a novelty than anything else. It is way too expensive and isn’t actually a water bottle holder, it is a tapered cup holder. I just thought I’d put it on here in case anyone was looking for a way to hold a coffee cup on their bicycles. Our next handlebar mounting option comes from Profile Design and is called the AeroDrink Bracket. This is a cool mounting option for Century and Airstryke handlebars. It fits other models with adapters. This bracket basically spans the bar gap and connects to both ends. It fits bars up to 120mm wide. The interesting thing about this bracket is that is can glue or screw onto the bars. Versatile and not that expensive at around 12 dollars. A aerodynamic option of water bottle mounting is available with seatpost mounted cages. 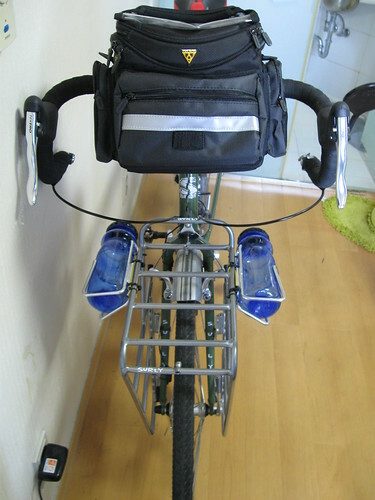 These cages mount on the rear part of either the seatpost or the saddle rails and usually hold two extra water bottles. The Profile RM System 1 mounts to the rails of your saddle (seat) and connects two bottle cages behind your seat. Make sure you have enough clearance from your loaded rack in the back to make this work. This model is 15.00 more expensive than the Profile RM 2. Profile RM System 2 is very similar to system 1 except this mounts to the actual seat post. There are a couple of problems that may arise using this mount. It could mount too close to your actual seat, block the bottles. It could also not tilt upward enough and interfere with your load. Not saying it happens all the time, but it can. A nice company called Tacx also produces saddle clamp bottle cages. This attachement hooks up and has 3 different positioning options for your cages. You can do one in the middle, or two on the outer holes, whatever you choose. Retails for around 15 dollars. Minoura also offers to seat post models, a one-version, and a two-bottle version. They have similar setups to the other cages so I’m not going to go into that now. Here are photos of the two-bottle version. If you’ve run out of mounting bosses on your bike frame, your also probably running out of space. My Surly Long Haul Trucker comes with three water-bottle mounting options on the frame, and with those filled, I have a little space on the top tube, the down tube, and the seat tube. With this in mind, companies produce strap-on cages so we can mount more bottles on our frame in those hard-to-get to places. Just remember that mounting cages is good not only for water, but is useful for carrying camping fuel and those heavy jugs of energy gel that proves very useful on bicycle tours. Elite VIP Bottle Cage Clamps allow you to connect your water bottle cages just about anywhere on your bicycle. They work up to a 50mm diameter and come with rubber pads to eliminate scratching. They also come with tension-tightening screws which makes these a winner for you ultimate bicyclists taking your tour on road and off. BottleFix is a basic model that clamps on right to the bike. It is adjustable with an allen key before mounting the bottle. This model with work on handlebars, frames, seat posts, and anything else between 15mm-60mm. Rixen and Kaul also offer the KLICKfix model, which is a quick-release version of the BottleFix. You can connect any regular water bottle cage to the quick-release adapter and then clip that adapter into the mounting system. Simply install and you can clip-in and out the cage. I’m still not entirely sure what the advantage of this system. I guess it simply allows you to completely take off the cage if you needed to for some reason. Here is a link to the mounting instruction manual if you want to know more about the system. For mounting to random objects on your bicycle, there are a number of universal water bottle mounting adapters available. Minoura offers the QB-90 model, seen here, for less than 10 dollars. Wear a hydration pack (such as CamelBak). These can lead to back strain, but may be necessary. I use one. Use a hip pack to hold your bottles. These inhibit movement. Carry water bags in your panniers. I use Platypus brand and love them. BPA free and inexpensive! They offer a number of models, some have drink valves, others are just roll-up bags that have caps on them. I use the model shown below because I don’t need a drinking valve. They offer a PlatyPreserve wine storage option as well, in case you need to preserve your fine wines along your tour. Check them out here. You could also drill your own holes and install water bottle bosses. We’ll get into that at a later date. I’m sure there are many more options, but this is a good start. If you’ve got the time, head over to the official website for the upcoming Long Haul for Hunger. I was searching around for some new touring bike models, looking for upgraded 2009 bicycles, and generally anything else I could get my hands on, and I stumbled across the Bianchi Valle. Bianchi also offers their ‘specialized’ touring bike the Volpe, a pretty nice touring bike with good features and a mid-range price tag. But when I looked through the specs for the two bikes, I found the Valle to be a decent option for shorter-range tours. It offers the same frame as the Volpe, CroMo steel frame and fork, and also has braze-ons to mount fenders and racks. Actually, the Valle comes with front and rear fenders. Another interesting difference between the two bikes is the Valle’s power-generating front dynamo hub. Both bikes have 32 spoke rims which aren’t going to be too reliable with extremely heavy loads, which is why this bike is a decent possibility for shorter tours or commuters. I don’t like the flat handlebars on the Valle, the drop bars on the Volpe are much more my style. I prefer the drop bars with the bar-end shifters. The short chainstay length of 425mm might cause a bit of a problem when loading racks and panniers on the rear of the bike, if you’ve had any experience with doing that on this bike let us know. I know the Surly Nice Rack offers enough clearance for this frame size with a properly adjusted rear Ortlieb pannier, I checked the pannier/rack combo on a lot of different bikes before I bought my racks. I think this bike is worth checking out if you are in the market for a commuter or a short haul bike. It’s another bike to add to your comparison list before making the big purchase. Don’t forget to visit http://www.theultimatetrek.com to learn more about the upcoming Long Haul for Hunger Bicycling Trek. Over 8,500 miles across 2 continents. We’re recruiting riders and would love to have you join for all or part of the ride. We haven’t spent any of the last couple of months posting about cycling nutrition and it’s finally time to start. While we’ve been researching and testing different products and methods of staying energized on a tour, we’ve kept quiet on the blog, but we are just about ready to release some of our findings. As you know it’s winter here in South Korea, so we’ve been freezing our boots off training for the upcoming Long Haul for Hunger, an 8,500 mile bicycle tour for charity. I’ll never forget the first week of training and nutrition testing when we set our base levels for the test, refueling on water alone before, during, and after our rides. Those 75-mile rides with four loaded panniers were more than painful and the last miles of each day were excruciating. Over the next week or two we’ll be featuring a series of articles on cycling nutrition. We encourage all of you to comment back on your own experiences with nutrition supplements, recipes, and anything else that might be helpful to our readers. Remember to check out our 8,500 mile trek at www.theultimatetrek.com. We are accepting entrants if you can ride all or part of the trek, drop us an email or comment.